I keep wanting to write “Professor McGonnagall”, but Matthew McConaughey (I had to copy that from Wikipedia) could not be further apart from that mix-up. Even though he takes center stage rather late in William Friedkin’s effort to proof old men can still be mean-spirited and without mercy, he owns the film immediately. Again, I wanted to write “he is eating the scene”, but I don’t know whether that’s proper English, and I feel hesitant to associate anything frugal with a film that circles around the cruel abuse of an already deep-fried chicken leg. Matthew McConaughey (pasted again) is a cop with a side job, which is to kill people. He is very professional about both his professions, almost admirable for the seriousness with which he lays down his rules and conditions. He is also very Southern about it, making his character a grotesque mixture of (Wild at Heart) Frank, (No Country…) Anton Chiguihr (couldn’t be bothered looking that one up) and (generic) Yanky Doodle Dandy – we can call such mixes a “Joe Cooper” performance henceforth, if there will ever be anyone trying something similar. The fun stops when his employers fail to comply with one of his rules, and another part comes into the mix, a Yanky-Doodle-Dandy-Chighuir-Frank-King-Lear. Only that the fun does not stop there, at least not for an audience with a sense of humour. He is a very scary character doing very scary things, and always kept me on the brink right-out laughter. Matthew McConaughey (still in the clipboard… good) can pull this off, because he has the face and the body to play an eerily handsome disgusting abomination playing his sadistic games. You can’t really blame him for his paybacks, as the rules were laid out clearly, weren’t they? 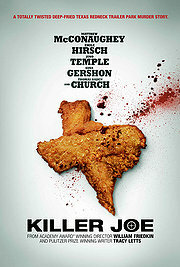 I would not call “Killer Joe” a return to form by a director made cranky and cynical by his career ups and downs. He is not returning anywhere, he has found a spot where he has never been before (with the slight exception of the very disturbing “Bug”): a chamber play with thoroughly unpleasant characters throughout, and with a path of fate that only points downward. Had I seen it without knowing who the director was, I would not have been surprised to learn that an angry young film maker has just been kicked out of the Academy and put all his and his family money into making this expression of loath. But as it is, I am quite happy to see that the old man also still has some grim energy left.